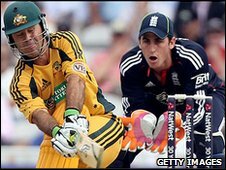 Australia won the fourth one-day international by 78 runs to end England's eight-match winning streak. Michael Clarke hit 99 not out and Ricky Ponting 92 in Australia's 290-5, the first of two dead rubbers after England had claimed the series on Sunday. Michael Yardy made 57 but England had a poor day with the bat and were bowled out for 212 in 42.4 overs, with fast bowler Ryan Harris picking up 5-32. That left it 3-1 to the hosts with the finale to follow at Lord's on Saturday. England had successfully chased Australian totals in each of the first three matches, and Andrew Strauss chose to repeat the formula in this 1300 BST start at The Oval. But for once he found himself chasing a stiff target when he and Craig Kieswetter marched out to face Shaun Tait and Doug Bollinger in the late afternoon sunshine. Australia's score had been built around a partnership of real class between Ponting and Clarke, accruing 155 in 25.4 overs. Skipper Ponting, who became the third man to move past the 13,000-run mark in this format, hit 10 boundaries in the 93 balls he received, gave no chances and did not take undue risks either. Not usually known for the most modern shots in the batting repertoire, he even exhibited a perfectly-executed reverse sweep off Yardy. Clarke was dropped on five by James Anderson at short extra cover off Graeme Swann, and looked busier than he has done of late, but a failure to hit regular boundaries towards the end cost him his century as he took a single to reach 99 off the first ball of the final over, and did not get back on strike. The only other Australian batsman to pass 20 was opener Shane Watson, who was 41 when hitting a catch straight to deep mid-wicket off Swann to leave both himself and non-striker Ponting mystified by the shot selection. England's most profitable periods with the ball were the first 10 overs, in which Australia were restricted to 38-1, and the batting powerplay, taken between the 43rd and 47th overs, in which Ponting holed out to extra cover off Anderson. As Clarke ran out of steam over the finish, Steve Smith struck a very handy unbeaten 18 from four balls. Kieswetter and Pietersen, so good for England in the World Twenty20, continued their modest series when dismissed for 12 and eight respectively. The Somerset opener was bowled through the gate by Harris, who also sent Pietersen on his way via an lbw decision from umpire Richard Kettleborough, with which the batsman, to judge by his meaningful stare down the wicket afterwards, was unimpressed. Replays, however, suggested the ball would have crashed into middle-and-leg. But the lbw verdict awarded by the other umpire, Aleem Dar, against Paul Collingwood was another matter. The ball from leg-spinner Smith struck the right-hander outside off-stump, but worse still, it was spinning further away from the stumps. Collingwood, to his credit, did not linger - but England were in poor shape when he trooped back to the dressing room. With Strauss (37) having edged Tait behind in the 14th over, Collingwood's demise left England on 90-4 in the 20th. England have come to rely on Eoin Morgan and with three effortlessly-driven sixes, all off James Hopes, he again showcased his phenomenal talents. But a typically enterprising knock of 47 came to an end when a thin edge off a drive to a wide delivery from Harris was easily held by wicketkeeper Tim Paine. Realistically, that put the kibosh on England's chase with 151 still wanted, five wickets in hand and a required rate of seven runs an over. Luke Wright has lost his number six spot to Yardy for the time being, and soon lost his way against Smith, bowled meekly behind his legs as he attempted to defend. Yardy and Tim Bresnan needed 100 off the last 11 overs when taking the batting powerplay, with Australia already heavy favourites. Three wickets then fell in the space of nine balls to Bollinger and Harris to leave number 11 Anderson having to face the Aussie pace attack for the first time in the series. And when Stuart Broad chipped a catch into the off-side in the 43rd over, the floodlights had barely started to take effect.